If you currently wear contact lenses or have recently been diagnosed with a common refractive disorder, regular eye exams are important for managing your contact lens prescription. For more than fifty years, our optometrists in Maple Ridge have been fitting patients with custom prescription contact lenses. By utilizing the latest technology and an advanced eye exam, we are able to precisely fit patients with specialty contact lenses that deliver clear, crisp vision. Our optometrist in Maple Ridge offers exams for individuals who have been told they are “hard to fit” for contact lenses. If you have been told you are not a good candidate for lenses because of an eye condition such as astigmatism, dry eyes, keratoconus, giant papillary conjunctivitis (GPC), presbyopia or post-refractive surgery, this does not necessarily mean that you can never wear contact lenses. 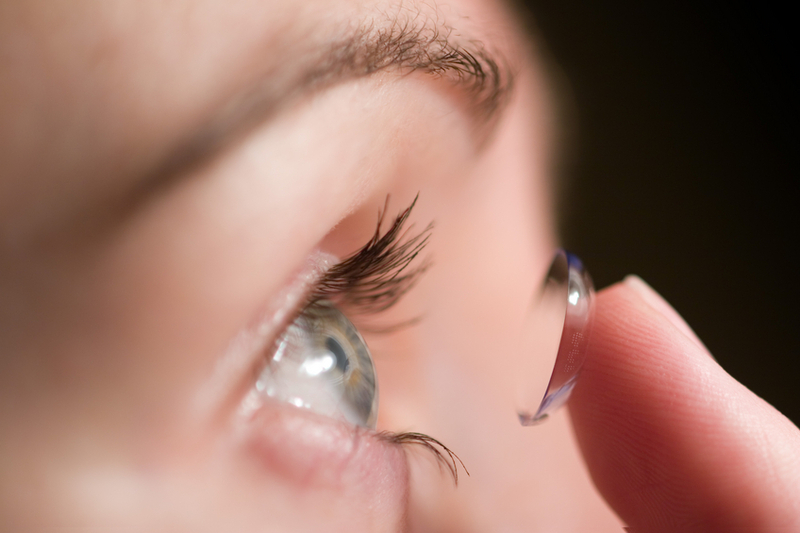 Our optometrist in Maple Ridge specializes in contact lenses for hard-to-fit patients. Using the latest technology and advanced equipment, we are able to more precisely measure your cornea in order to achieve the best contact lens fit possible. Keratoconus, for example, is a progressive eye disease in which a normally round cornea begins to thin and bulge into a cone-like shape, affecting your vision. While milder forms of keratoconus may respond well to soft contact lenses or eyeglasses, as the disease progresses, glasses or regular soft contacts may not be sufficient to correct your vision. In this case, you may need custom fit soft contact lenses that are made specifically for individuals with keratoconus or gas permeable contact lenses. When soft contact lenses are not a good option for vision correction, gas permeable contact lenses have a more rigid material, which enables the gas permeable lens to “vault” over the cornea, replacing the cornea’s irregular shape with a smooth surface. Our optometrist in Maple Ridge has substantial experience fitting contact lenses for patients who have been diagnosed with keratoconus or other eye conditions. In some cases, such as advanced keratoconus, piggybacking contact lenses is necessary in order to achieve ideal vision correction. Rigid lenses can become uncomfortable, making in painful for individuals to wear these lenses all day. In this case, our optometrist in Maple Ridge may recommend piggybacking a soft lens underneath the glass permeable lens. The soft lens acts as a cushion to reduce or eliminate discomfort associated with wearing hard lenses. If you have been diagnosed with astigmatism, you may benefit from wearing toric contact lenses, which are specifically designed to correct astigmatism. The soft toric lenses are immediately comfortable and correct more severe cases of corneal astigmatism that are not responsive to regular contact lenses. Fitting toric lenses is more difficult and requires a specialized eye exam, which is available through our Maple Ridge eye center. Whether you have keratoconus, dry eye, severe astigmatism or another vision condition, you may still be able to wear contact lenses. Contact our eye doctor to learn more!